Jeans: You’ll need boot cut jeans, but straighter legs and trouser cuts will work just as well. Choose any wash and remember that black-black and grey jeans are great options too. Tunic sweater: Opt for knitwear that’s longer in length. Mid-thigh is best but you can go shorter if you’re petite. Form fitting tunics are lovely, but voluminous styles are more forgiving on the midriff area (think empire cuts and banded styles). 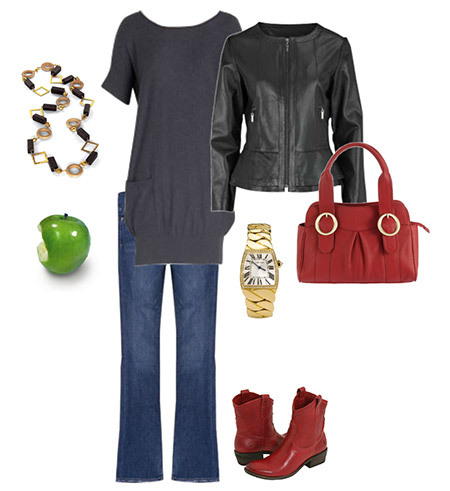 If tunic sweaters are too warm, opt for tunic button down shirts, tunic T’s or tunic knit tops. Remember that you can belt a tunic to rein in some of the volume so don’t dismiss the idea yet! Of course, wearing a normal length top with pants is always an option if tunics aren’t your thing. But I’m encouraging banded 80’s style tunics because the look is “new”, forgiving and very comfortable. Leather or pleather jacket: It’s the jacket that adds structure to this formula and there are countless styles of leather and pleather silhouettes this season. 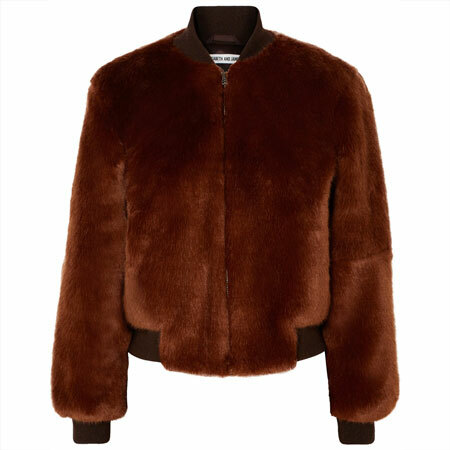 Think beyond black leather and try colours like cream, caramel, burgundy, teal and blue. If you don’t like biker jackets, opt for bomber styles, classic blazer and peplum looks, or groovy belted 70’s vibes. The jacket can be short to add a dramatic layering effect over the tunic, or longer for a more streamlined look. After dressing many women in this formula, I’ve found that empire cut tunics look best when matched with longer length jackets. 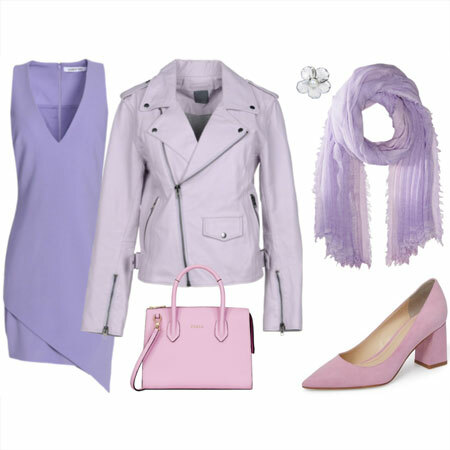 A cropped jacket tends to look best over a streamlined tunic that tapers in at the hem when worn over jeans. If leather and pleather are not your preference, complete the outfit with a corduroy blazer, military jacket or retro trapeze jacket instead. Ankle boots: Casual flat ankle boots are a no-brainer, but you might like to try cowboy boots too. 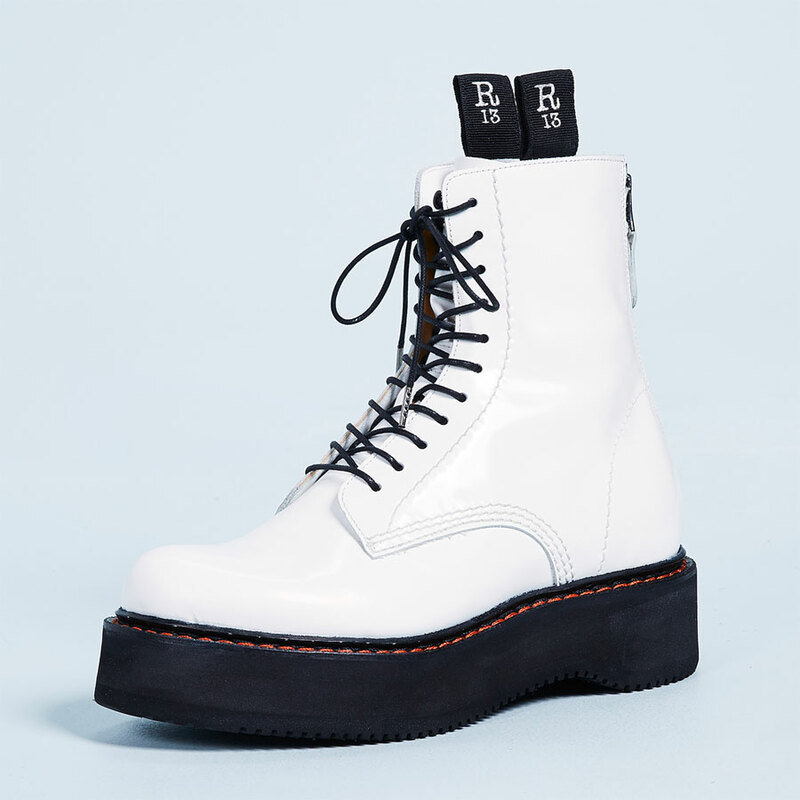 Short Dr. Marten boots will also work and so will styles with a low heel or wedge. Once again, think beyond black and try footwear in colours like tan, blue, grey, red, eggplant and burgundy. We tend to wear lots of black, brown and grey tops in Autumn and Winter so adding an unexpected colour with footwear makes a refreshing change. Ankle boots are not your only option here. Swap them out for converse sneakers, flat oxfords and loafers if you want to wear cozy socks, but ballet flats are also great when it’s warm enough to go sockless. Scarf: Scarves are not essential, but they’re always visually appealing. Versatile pashmina wrap-style scarves are my top pick because they look great both indoors and outdoors. Silky scarves are just as fab, but not as casual. I’m not particularly fond of neckerchiefs because they cut your long lean line, but they can work if you have a long neck. Scarves are best when tied vertically (like this, this and this). Handbag: A flat tote is the obvious choice, but if you need both hands free to attend to little ones, a cross body bag is the solution. Accessories: You know the drill, attend to your specs first and your watch second, because they’re the most important accessories on your body. A statement necklace is a nice alternative to a scarf and earrings add a nice touch. And now some examples. The first is an interpretation on the daring side of modern classic, the second is more trendy and urban, while the third is bohemian and earthy. Remember that this is a formula, so you can substitute the items in the visuals for those that that are more to your taste. Also, clicking on the pictures will take you to Polyvore where you can see the individual items, but take the specific items I chose with a grain of salt. I selected the items purely based on what was easily available and what made the right visual impact. So I am not suggesting that you need a $21,000 Cartier watch to make the modern classic look work. I like to sport formula #4 with converse sneakers and loafers because I don’t own flat casual ankle boots. But I’ll sport a smart casual version of the formula with dressy heeled ankle boots or booties and a silky blouse instead. Mums on the go, I’d love to hear your suggestions on how to improve this formula. Very nice. I particularly like the modern classic and the trendy style, since they come close to my personal style. I think this look works with skinnies, too. I own this exact white leather jacket and can only recommend it: it´s instantly stylish, and the material is indeed very forgiving when with your kids. Great formula! I did this on Sunday, but am almost embarassed to post a pic, because my components aren’t nearly as hip as these you’ve pictured. But hey, we work with what we’ve got, right? I’m so enjoying the MOTG posts. I try to move through the formulas each day when I dress. Keeps me out of outfit ruts. I really love the formula posts, especially when you give several examples that fit the formula. Its easier to translate to my real wardrobe that way. This one is tough for me, because I don’t have a tunic sweater, but you mention the tunic button-down as an option. I have a shirtdress that is too long, and maybe will hem it to tunic length. Those red boots remind me of Nicole! I have difficulty wearing ankle boots. Usually the boot rubs my ankle in an annoying way. Flattering casual tunics are also hard to find. But I like the concept! This is probably my favorite option because I have all of the components to make it work. Love the look. How did you decide which one gets the cupcake? I want that spot tunic dress! love them all – wish they were in my closet right now! Angie, I have a question! Is it appropriate to wear the leather jacket indoors? I suppose it depends on the type of leather jacket, but when I wear my moto jacket I often feel like it’s outwear and it goes off when I come inside. I’ve love to find a cropped leather jacket that I can wear indoors, at work, etc. What, no real people this week? This surprises me but I like your modern classic interpretation best. It’s nice to see red (so to speak) after all the purple this fall. You’ve inspired me. This is a great formula until about Thanksgiving because of the footwear. After that, ankle boots are a bit chilly. So my resolution is to try this formula a bunch of times before then! Thanks ,Angie, for the inspiration! I love this look, probably because I feel it is sort of in my safe, comfort zone, and I think even I could keep it flop proof. I cannot pick between the 3 outfits, I would wear all or any of these pieces. I like the third look the best – because of the below-the-waist length coat. I am concerned about how the shorter waist length fitted jackets, look over the heavier, bulky sweaters. Are there any models wearing that style so I can see it? Quite right, queenie. You’ve got to work with what you have and take it from there. Always evolving! Phoebe, the formula will work with skinnies if you tuck them into longer boots – which is combing formulas #2 and #4. That’s a fab combination too. Shiny, ankle boots *can* rub on the ankle, but styles with elastic insets really help. Also, it’s all about finding a comfortable version. They are out there! Marianna, my own style is the inspiration for the “trendy and urban” persona and I love dense chocolate cake, so that’s why that outfit got the cup cake. And good question about wearing a leather jacket indoors. It’s absolutely acceptable but it depends where you are indoors. If you’re visiting another home, eating out, at work, running errands, watching your kids at dance class – then you can keep your leather jacket on unless you’re hot. But I wouldn’t keep mine on at home. Does that make sense? This is the formula that has been easiest for me to put examples of together from my own wardrobe. 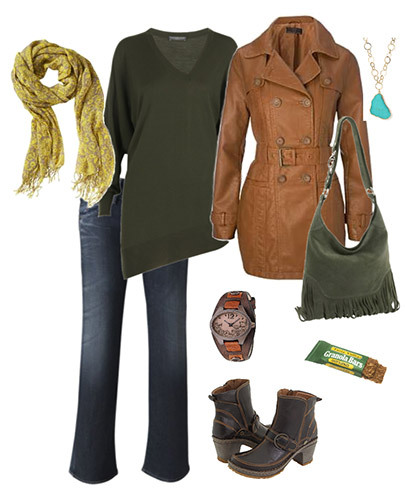 I love outfit #3- I have that scarf in my shooping bag at Old Navy. I’m going to take pictures of my outfits when I get dressed, (woke up at 4, so having a bit of a jammie day today) so I’ll post them to the board later. I haven’t been able to wear this much, just because it’s too hot for a jacket still most days, but on cooler days I am grabbing for these combo’s. Another great formula! I really love the urban version of it and would wear it whole as is. I have a question regarding sweater tunics: I have and wear a couple of them, and they are all voluminous/empire styles. Is the straight/very fitted sweater tunic ( like in the first illustration) for racy rectangles only? Or could it work for other, curvier body types too, especially if paired with bootcut jeans? Thanks! You’re a hoot Angie;-) I love all the snacks, they are indispensable in my book! I don’t own a longer tunic style sweater at the moment, but I’m certainly on the look-out for one with a banded hem, love that. All three looks are fantastic and I’d sport 1 and 2 in a heartbeat. As a petite pretty pear I am very concerned that a long tunic and cropped jacket will draw a lot of attention to my rear end. Any thoughts on this? Oh that trendy and urban outfit is based on my life, including the cupcake! I want it NOW (both the outfit and the cupcake)! That black and blue polkadot top and white moto jacket are heavenly together. I am a non-MOTG, but I wear this formula a lot. I love how the Polyvores look but I haven’t yet been able to pull off a short jacket with a longer top. I wonder if this look is more difficult for the bigger-bottomed? When I’ve tried this I feel like it’s shining a big spotlight on that area! Love the bootcut jeans, and what a great idea to actually wear them with boots! This is one formula that I would like to try but will have to wait–I am on an all-out ban from shopping until the end of NOvember and I own no sweater tunics whatsoever. I ofcourse love the modern classic version best, but again that white leather jacket continues haunting me… Thanks for the input on that Phoebe, it makes me feel better about possibly buying one in future.I have been paranoid about white jackets while having my two little ones in tow. Love all the looks!! I esp like the first one Modern Classic. Do you think an over 50 pear could pull this off??? Maybe exchange the red for black boots and bag? I love them all! And I’m wearing this look today, pregnant style, without even planning it. But I went for skinny zipper jeans and low heeled dressy pumps. The middle of the day is still too sunny and warm for completely closed in shoes. As always, I LOVE it (I would wear #1 and #3 as is any day… where’s the money tree, anyway?) and I especially love the granola bar in #3. You’re too funny, Angie! I really want that scarf, turquoise pendant, and fringed bag in particular. Too bad the bag isn’t available online in that color or it’d go straight onto my Xmas list. Lovely outfits! I am especially loving the giant dots tunic. Interestingly enough, I would be able to wear only the boho look based on the items in my closet. And those who know me on the forum, also know I ain’t a boho girl. Angie, how about some ensembles for the non-trust-fund mommies? I added up the prices of the pieces you used to compose the third look, the crunchy granola one, and the grand total is…..$2,062! Are you for real? Elizabeth, In all my time reading this blog and participating in the forums, not once has Angie imposed her picks on anyone, style-wise or price-wise. These MOTG formulas are exactly that: Formulas. To be used as guidelines and to be adopted and adapted to suit one’s own requirements and lifestyle. There are plenty of great sites that offer great budget alternatives (The Budget Babe is excellent) if the items in the outfits posted are not in your price range. But that is not what this site is for. What you take away from here are the basics of style and how to recognize, cultivate and own yours. Elizabeth, my budget ranges from nonexistent to microscopic and I use these formulas all the time. Angie does not tell you WHAT to wear but how to wear it. You have to use your own creativity to adapt these formulas to fit your budget and style preferences. I get it, Vani and Maya. I just think it would be refreshing to see some more accessible options. Ever since the $5,000 challenge I have been dreaming of Cartier watches, I would prefer the Tank Solo with the gold casing (for future reference). On paper I found this formula the least inspiring of the 10 looks, however your fantastic illustrations have motivated me into action and I’m determined to give it a go. Elizabeth, we have many budget shoppers on the forum who would quite happily replicate these looks for less than $100. 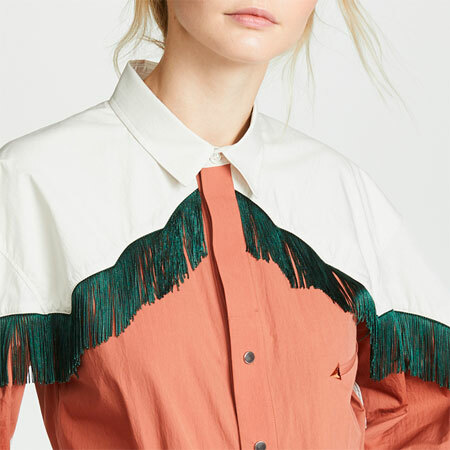 I think you have to appreciate the fact that it takes a lot of time to sort through the options on Polyvore, put these images together in a way that creates the right effect, and write the blog post to accompany them. Angie can’t accommodate every individual person’s unique situation when she puts these outfits together. It is up to you to make it work on your terms. If you need help or want ideas on how to make these looks work for you, I would encourage you to join the forum and you will get lots of valuable advice. You should also check out the Budget Fashionista. She is a pro at recreating high end looks on a low end budget. Pretty pears look great in tunics. In fact, tunics are flattering over a curvy bottom. If the tunic style is not working for you, you’re wearing the wrong tunic. It’s all about the details – length and structure. Wear it at a shorter length if your leg line is naturally short. Add a bit of heel too. But if you feel you can’t get into the tunic look, simply substitute that item with a regular length top. But I wouldn’t be doing my job if I wasn’t helping you evolve your look by encouraging the tunic! Tanya, straighter tunics work well on curvy bods, especially on those with a strong shoulder line. Make sure the neckline is flattering and add a waist cinching belt to lengthen the leg line. The effect of wearing a shorter layer on top of a longer layer also lengthens the leg line. Jennell, absolutely. I want to see you rock this formula. I wasn’t too sure about it when I first saw the formula, but I adore the idea now. I think I have the perfect way to do it too! Great post Angie! 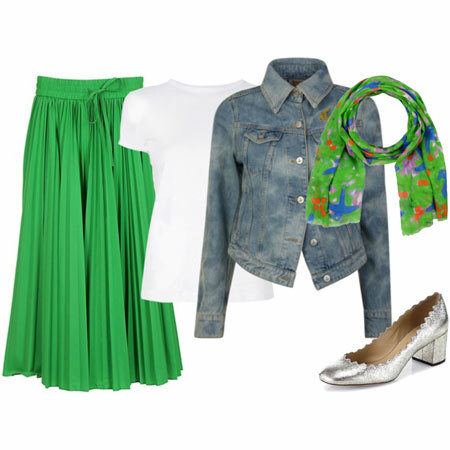 I also love how you put the Polyvore outfits together. As someone who uses Polyvore regularly, I completely understand where you are coming from re: the price and visual impact of items. I don’t even check the prices on the outfits I put together, they are just supposed to provide a visual representation of what I am talking about, so the readers can see and adapt it to their own style. It’s really hard to find photos from Forever 21 or other budget retailers that work for a blog post such as this. Elizabeth, I have seen all those types of items Angie posted represented at more accessible retailers such as Ann Taylor, Express, J. Crew, Banana Republic, etc. I know you will be able to find them on a more affordable scale. I was so proud of this outfit – especially since it cost less than $20 and looked FABULOUS!!! All bought at Goodwill – hey, don’t knock it!! LOVE IT!! However, after reading YLF, I could have spiced it up with a scarf…..I have so much to learn about accessorizing! Very interesting SS that you came up with that great outfit for under $20. I love that. I am so excited that I am finally getting it with these formulas. Thanks for hammering it home Angie. This is a cute look, but I’m reluctant to wear longer sweaters. Can they really flatter hourglass-shaped women? My bust and hips are very, very full, and my defined waist is the only narrow/slender part of my body. I’m afraid of looking extremely heavy in a long sweater, though I notice that they are everywhere now. I love all of these outfits!! I’m wearing a similar outfit today. A long purple sweater with black boots. I love how you took the time to add an appropriate snack to each outfit. Hee hee!!! Look 3 is super chic. I love the color of the scarf paired with the moss green sweater. Of course, the boots are awesome, too.